Political Design: Graphic Artists Urge Voter Turnout This election season, the American Institute of Graphic Arts asked members to design posters encouraging people to vote. 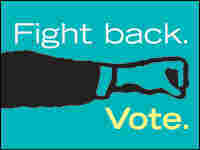 The organization is now displaying more than 200 "get out the vote" posters on its Web site. NPR's Melissa Block speaks with some of the designers. While celebrities like Sean "P. Diddy" Combs and Christina Aguilera have been out encouraging the public to vote, some of the most clever and provocative "get out the vote" messages have remained tucked away on a Web site. Earlier this year, the American Institute of Graphic Arts asked designers to create original posters encouraging voter turnout. Artists from all over the country submitted more than 200 posters. Now, the design organization is displaying them online and urging members to hang the posters where people can see them. NPR's Melissa Block talks with some of the poster designers about their political creations.